Opinions differ, whether Kumana National Park in the southeastern corner of Sri Lanka is worth the long way to the East Coast. It has to be sad, Kumana is not rich in big game wildlife. Compared to Minneriya and Udawalawe, there are only few elephants roaming in Kumana. And in contrast to Yala and Wilpattu, leopards are almost never spotted on half-day safaris. Some guests having read in their guidebooks that more bird species occur in Kumana than in any other area of Sri Lanka, are even disappointed, that there are not larger amounts of water birds than in Bundala, which is much closer to the tourist areas, and that birds of prey are less often sighted than in Gal Oya. But other travellers fall in love in Kumana, and we also do and recommend visits of Kumana with an experienced ranger and birdwatcher. The reason is: As this national park is off the beaten path, it gives the best impression of the untouched Sri Lankan jungle. Kumana is not just a fenced larger zoo, it’s a remnant of the genuine natural environment of the tropical island’s dry zone. Highlights of Kumana are the various freshwater lakes and brackish lagoons. The wetlands of course are the reason why Kumana has earned its reputation as the island’s avifauna hotspot concerning the variety of species. Kumana National Park, formerly known as Yala East, can be called the smaller brother of the adjacent Yala National Park, an alternative for those who like to avoid the crowds. However, in contrast to Yala Block 1, where spotting various exciting animals is almost guaranteed, Kumana is less recommendable for half-day safaris than Yala West. This has to be said in order to be honest with the reader. Kumana was a perfect place for overnight stays within a wildlife park, as guests were rarely disturbed by foreign groups at camping sites in this remote national park. However, camping inside the national park boundaries has been prohibited for the last few years. Camping is only possible with special permissions from the wildlife department or in the wilderness just outside the national park borders in the Kudumbigala area. Early morning is the best time to observe birds in this former bird sanctuary. For wildlife experiences, moonshine safaris in Kumana National Park can be rewarding, too. However, half-day excursions are recommendable for those guests who plan to stay at Arugam Bay anyway. For those guests, who travel along the classic route (Cultural Triangle – Hillcounty – Southcoast) and intend to include a half-day safari, the long journey to the East Coast is less recommendable, genuine wildlife parks such as Wilpattu, Udawalawe and Yala are on the way. For, those who like to leave the touristic route for an experience of an undisturbed nature reserve, Maduru Oya National Park is not as far away as Kumana. In a narrow sense, Kumana is only the name of a former village at the national park’s southernmost border, framed by the ocean in the southeast and by the Kumbukkan River in the southwest. Kumbukkan Oya marks the border between Eastern and Southern Province and between the contiguous national parks of Kumana and Yala. No bridge crosses this river. The northern main gate of the park is in 19 km distance from the river mouth of the Kumbukkan Oya (17 km, as the crow flies). The entire Kumana National Park spreads over an area of about 350 square kilometres. There are more lakes and less rock bolders in Kumana than in the neighboring Yala National Park, but all in all it’s a similar setting. 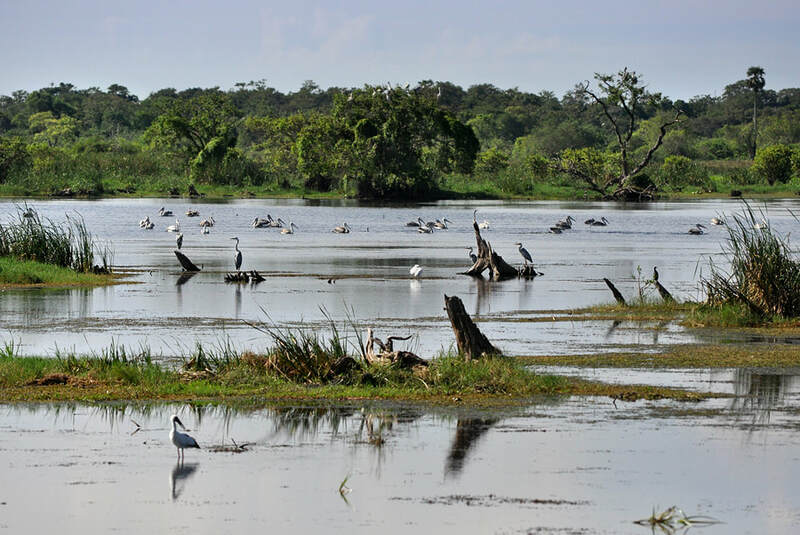 The diverse wetlands are the reason why Kumana attracts so many bird species. About two dozens lagoons and tanks are found mainly in the southern quarter of Kumana National Park. ​Halfway between main gate at Okanda and Kumana at Kumbukkan Oya is a large brackish swamp called Bagura Kalapuwa. Kalapuwas are a type of lagoon typical for the eastern and southern seashores of Sri Lanka. Their connection to the ocean is not an opening but a short flowing river. This is why Kalapuwas are slightly less saline than lagoons. Almost every stream in this area has such a Kalapuwa broadening before entering the ocean. There are four of them along a caostline of only 5 kilometers. They are separated by rocky outcrops such as Marescaux Rocks. After Bagura Kalapuwa the jeep tour will run along Andarakala Kalapuwa, Itikala Kalapuwa, and Yakkala Kalapuwa. They are shallow, with maximum depths of less than 2 meters. Kalapuwas attract migratory birds during the northern hemisphere winter months. At the upper banks of Kalapuwas are extensive grassland plains, where chances are good to observe large herds of deer and buffalos. The last southernmost body of waterbefore arriving at the boundary river Kumbukkan Oya, though situated in only 250 m distance from the beach, is even less saline than a Kalupuwa. It’s a mix of freshwater and brackish water. This most famous water body of the national park crowded with wading birds is called Kumana Villu. It’s fed by rainwater and a 600 m long canal branching off the Kumbukkan Oya very close to the river mouth and then running parallel to the sea entering the Villu. Villu is a term for sand-rimmed basins in natural depressions filled with rainwater and set within jungle areas. In a sense, Villus are very large waterholes. Kumana Villu, covering about 2 square kilometers, has partly an open water surface but is a mangrove swamp in its southern half. In contrast to the Kalapuwas mentioned above, Kumana Villu is less frequently subject to inundation with seawater. It’s this diversity of wetlands that makes Kumana an ideal nesting ground of aquatic birds. Apart from the Kalapuwas and the slightly saline Villu, most of the waterbodies in Kumana national park are freshwater ponds and waterholes further inland. One of the largest of them, also in only 1.5 km distance from the Kumbukkan River, is Kumana Wewa, an ancient tank from the first millennium. It has a diameter of more than one kilometer. Don’t confuse Kumana Wewa (a freshwater lake) with Kumana Villu (a slightly brackish marsh). They are situated in more than 2 km distance from each other. The former marks the northern border and the latter the southern end of what was once the sparcely populated Kumana village. Most camping grounds are situated in this area, which is the Kumana in a narrow sense, just in between Kumana Wewa and Kumana Villu. 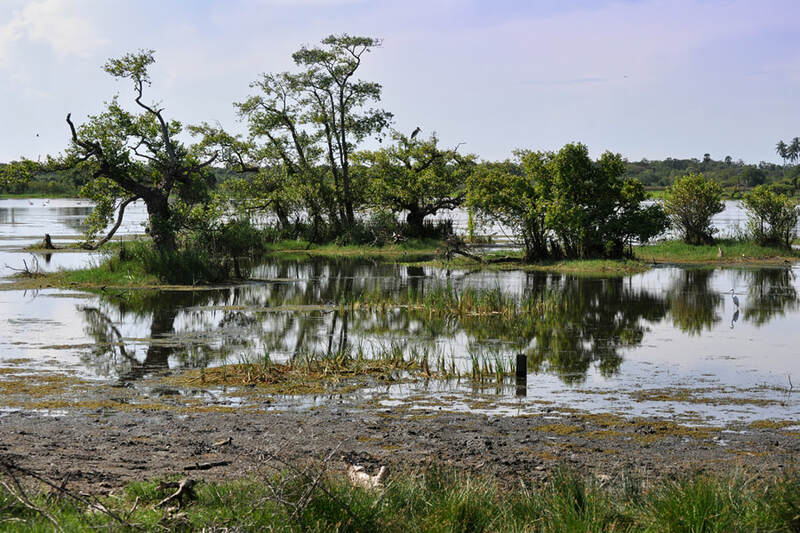 Scattered in the Kumana National Park are several more freshwater ponds that are remnants of ancient tanks such as Eraminiyan Wewa, Aluthgama Wewa, and Bakme Wewa, all of them in only 1.5 km distance from the Kumbukkan River. Further away from the sea and from the river are smaller freshwater ponds, ther are called walas or wilas, whereas the waterholes are known as Pokunas. In contrast to wewas, they are of natural origin. Three neighbouring ponds called Kudawila, Thunmulla and Kotalinda Wala are situated close to the main track, between Bagura Kalapuwa and Andarakala Kalapuwa. They are habitats of mugger crocodiles. All freshwater pools alike – wewas, walas and pokunas – are watering places and favourite whereabouts of wild animals. The climate in Kumana is similar to that of neighbouring Yala National Park. The mean annual temperature is about 27 degree centigrade, annual precipitation is 1,300 millimeters. Local rainy season is from October to January, peak dry season is August and September. The vegetation in Kumana consists mainly of typical dry-zone scrub jungle, interspersed with grasslands and mangroves near the ocean and comparative large areas of dense forests further inland. The riverine forest at the southwestern border is dominated by Arjun trees (Terminalia arjuna), known as Marudhumaram in Tamil and Kumbuk in Sinhala. It’s the namegiving plant of the Kumbukkan River. Kumbuk trees have pale yellow flowers which blossom in northern hemisphere spring months. The woody five-winged fruit appears in autumn. The inland forest's flora is rich in evergreen obtuse-leaved mimuspos (Manilkara hexandra), known as Khirni or Ksirni tree in many Indian languages or Rayan in Gujarati. A shared Sinhala and Tamil name of this tree is “Palai”, though “Kanup-Paalai” is often used in Tamil and “Palu” is more common in Sinhala. The yellow Palu fruits grow in July and August. They are the favourite food of sloth bears. This is why chances are not too bad to spot Sri Lanka’s rare “Baloos” during the summer months in Kumana National Park, particularly in the northern area near the main gate. Ceylon Satinwood (Chloroxylon swietenia), known as “Burutha” Sinhala, is a tropical hardwood occuring quite frequently in Kumana National Park. It’s native not only to the Indian peninsula and Sri Lanka, but also to the African island of Madagascar, which otherwise is famous for its isolated flora. The Golden-rain or Canafistula tree (Cassia fistula) is well-known by its Sinhala name “Ehela” in Sri Lanka. The flowering plant of the species-rich Fabaceae or Leguminosae family. The Golden-rain tree is native to the subcontinent and adjacent regions of tropical Southeast Asia. It is the state flower of the South-Indian state of Kerala, where it is held in high esteem by the population. Another flowering tree of the Kumana scrub jungles is the small crooked Beedi leaf tree (Bauhinia racemosa). In India, the leaves are used to produce a thin Indian cigarette called Beedi. A typical shrub on saline soils is one the many plants called Mustard tree (Salvadora persica), more specifically known as Salt brush or Toothbrush tree or Chewstick tree, as it‘s fibrous branches have been used as a natural toothbrush by Muslims for centuries, as Prophet Muhammad recommended its use. Due to the wood‘s antiseptic properties, it‘s recommended for oral hygiene by the WHO. It had already been used as toothbrush by Babylonians, Egyptians, Greeks, and Romans. The Arabic names are Siwak or Arak or Khamt. The Sanskrit and Hindu terms are Peelu and Meswak. In Tamil, it‘s called Uka or Ukaay. The Sinhala name is Malitta. The Mustard tree is widespread in dry regions of the Middle Eest and Northern Africa. There is a popular belief that this species was introduced to the subcontinent in the medieval period, when Muslim merchants used it as fodder for horses and camels. But the tree is already mentioned in ancient Tamil literature, proving that it occured in India already two millennia ago. The dominant tree of the brackish swamps of Kumana Vullus is swamp mangroves villu is the Crabapple mangrove (Sonneratia caseolaris). Besides Sonneratia alba, it‘s the most widespread mangrove tree at the Indian Ocean and at the South China Sea. Known as „Kirala Gedi“ by Sinhalese people, the pulp of the fruit is used in fruit shakes with coconut milk. The predominant reed at Kumana Vilu is Lesser Bulrush (Typha angustifolia), which is typically found in brackish locations throughout the northern hemisphere. Common aquatic plants of the swamp are various species of the Ludwigia genus. 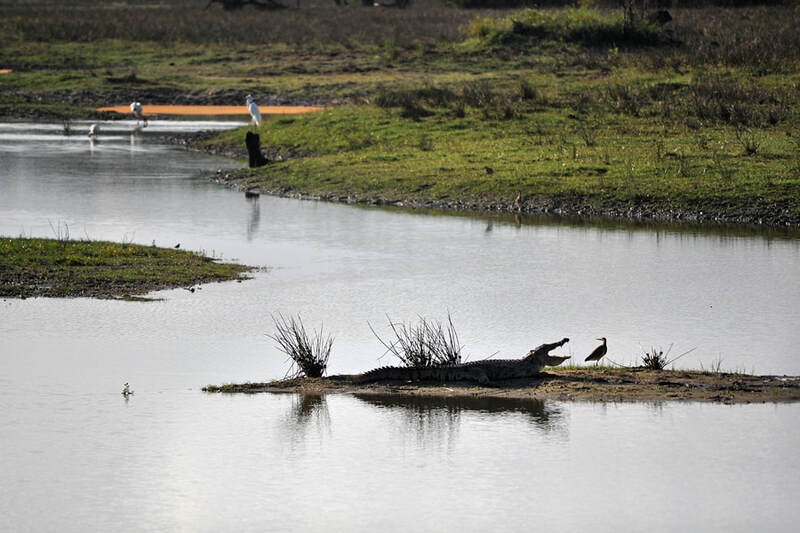 Kumana, although not as rich in wildlife as Yala, is an even good place to sight mugger crocodiles (Crocodylus palustris), known as the Geta kimbula in Sinhala and Chaanakan in Tamil. On Kumana safaris, several muggers can often be seen in the shallow sloughs of Kudawila, Thunmulla and Kotalinda Wala. Mugger crocodiles are native to all countries of the subcontinent. They also occur in small numbers in Iran and Southeast Asia. Of all Southasian nations, Sri Lanka has the highest density of mugger population. The island is inhabited by a few thousand of them, whereas the much larger coastal plains of Sindh and Baluchistan in Pakistan have only a few hundreds. Even the area of Yala and Kumana has more muggers than the entire nation of Pakistan. The sanctuary with the highest number of muggers however is outside Sri Lanka, it’s Crocodile Bank near Mahabalipuram in the Southindian state of Tamil Nadu. The numbers of mugger crocodiles in South India and Sri Lanka appear to be stable or even rising, although crocodiles are hunted illegally by frightened villagers. But the mugger crocodile population in all other regions has decreased significantly in recent decades. This is why it is considered a threatened species. In South Asia, the estimated number of human victims of mugger attacks is about half a dozen or one dozen persons annually. In Sri Lanka, fatal attacks occured, albeit not each and every year. Other common reptiles occuring in Kumana National Park are Bengal monitors (Varanus bengalensis), and freshwater turtles such as Indian flapshell turtle (Lissemys punctata) and Indian black turtle (Melanochelys trijuga). Sea turtle species occasionally nesting at the beaches of Kumana include Green Turtle (Chelonia mydas), Loggerhead Turtle (Caretta caretta), and the Olive Ridley Turtle (Lepidochelys olivaceae). Roughly three dozens of elephants roam in Kumana National Park. 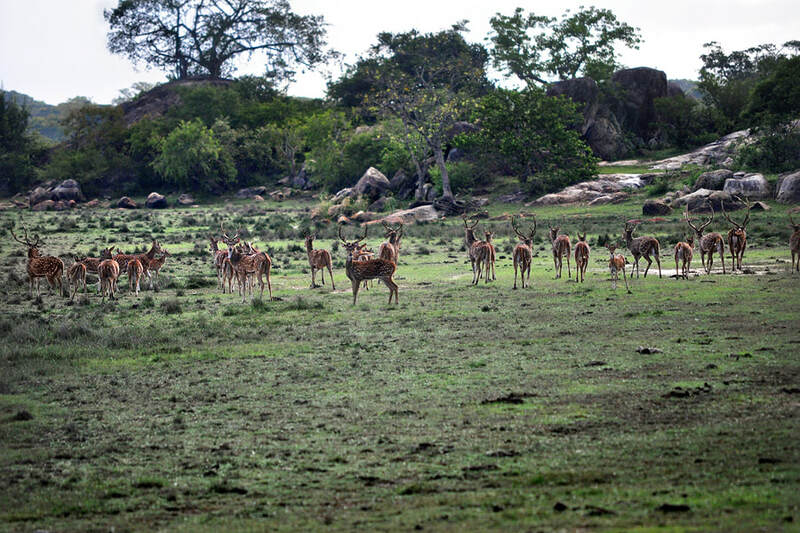 That’s a comparatively small number, but some individuals can usually be spotted on a half-day safary, whereas herds are rarely seen in this wildlife sanctuary. Besides elephants, leopards and sloth bears are Sri Lanka’s most popular beasts. Both species occur in Kumana. Leopards are almost never spotted. On the other hand, sloth bears can somtimes be seen on safaris in the peak dry season, which is also Palu fruit season. Chances to see golden jackals or wild boars are much quite good in Kumana. Undoubtedly, the most frequently seen mammals in this national park are feral Water buffalos and Chitals, also known as Axis or Spotted deer. Kumana National Park in Sri Lanka is renowned for its avifauna, particularly its large flocks of migratory waterfowl and wading birds. Due to the influx of migratory birds during northern hemisphere winter months, the number of bird species in Kumana National Park amounts to more than half of the 433 bird species recorded in Sri Lanka. This means, pretty much all dry zone bird species of Sri Lanka occur in Kumana. Large numbers of wading birds nest in the mangroves in May and June, including Eurasian spoonbill (Platalea leucorodia), Black-headed ibis (Threskiornis melanocephalus), Grey pelican (Pelecanus philippensis), Painted stork (Mycteria leucocephala), and Asian openbills (Anastomus oscitans). These very common birds in the wetlands of Kumana National Park can be sighted throughout the year. Regular sightings of water birds also include herons, egrets and cormorants. Among the breeding inhabitants of the Kumana Villu are rare species such as Black-necked Stork (Ephippiorhynchus asiaticus) and Lesser Adjutants (Leptoptilos javanicus), a common bird in Cambodia but not in Sri Lanka. Blue peafowl (Pavo cristatus), Malabar pied hornbills (Anthracoceros coronatus) and Green bee-eaters (Merops orientalis) will be seen almost certainly. Frequently observed birds of prey include Crested hawk-eagles (Nisaetus cirrhatus), Brahminy kite (Haliastur indus), and Shikra (Accipiter badius). Very common birds endemic to the island nation are Sri Lanka spurfowl (Galloperdix bicalcarata), Sri Lanka junglefowl (Gallus lafayetii) and Sri Lanka brown-capped babbler (Pellorneum fuscocapillum) inhabiting the ground level of the Kumana scrub jungles, whereas Sri Lanka hornbill (Ocyceros gingalensis) can be seen in trees. Red-Faced Malkoha (Phaenicophaeus pyrrhocephalus) is rarely spotted close to the Kumbukkan River. Regrettably, many birdwatchers report that the number of birds observed in Kumana National Park has fallen in recent years. Similar to Yala National Park, Kumana incorporates cultural heritage sites such as monastic caves and rock inscriptions dating back to the prechristian era. The lakes called Wewas, as already mentioned are remnants of tanks of the ancient Sinhalese civilization called Ruhuna (Rohana in Pali). Surprisingly, today’s wildlife areas of Yala and Kumana had been the heartland of Ruhuna, which was the most important cultivated zone in the first milleninium, secondonly to the Rajarata around Anuradhapura. 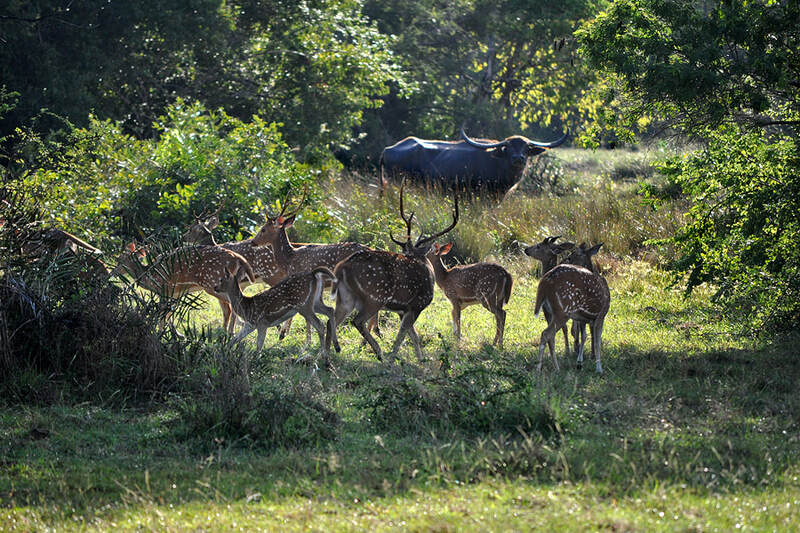 For centuries, Kumana National Park lies on the Pada Yatra pilgrimage route from Jaffna to Kataragama. AlthoughSinhalese take part in this annual pilgrimage, too, it is a predominant Tamil event, formerly also attracting pilgrims from mainland India. Parts of what is now Kumana National Park was declared Bird Sanctuary by the British administration in 1938. It was established as a national park under the name “Yala East” in 1969. Afterwards, it was renamed “Kumana National Park” in 5 September 2006. The park was closed from 1985 to 2003 due to guerilla activities. Like Yala, Kumana was severely damaged by the Boxing Day tsunami in 2004. Since the end of the civil war in 2009, the park welcomes visitors again, mostly day trippers from Arugam Bay. Kumana National Park is best reached from guesthouses in Arugam Bay or it can be tied into a multi-day safari including camping near Kumana Wewa. The gateway to Kumana National Park and the park office are are located at Okanda and accessed through the Kudumbigala Sanctuary, 28 km south of Arugam Bay and 16 km south of Panama. There are five safari options available: Morning safaris and full-day safaris should optimally start in Arugam Bay as early as 5.30 a.m., in order to reach the wetland avifauna soon after sunrise. Evening safaris should depart from Arugam By at 2.30 or 3.00 p.m. Camping safaris including a moonshine safari are only recommendable during days near full moon. Multi-day camping safari combining Kumana with Yala blocks 1 and 2 and crossing Kumbukkan Oya require special permission and are not possible after heavy rainfall. There are five camp sites within the Kumana National Park, all of them are perfect starting points for nighttime observations and early morning birdwatchin. Eda Kumbuka Camp Site is named after the Kumbuk trees prevailing in this area. River mouth (Moya Kata 1 and 2) at the Kumbukkan River is an attractive camp at an inshore beach. Madametota and Heraligas Ara are situated near Kumbukkan Oya, too. Gal Amuna Camp Site is located near a natural rock dam across the Kumbukkan Oya. Because of its scenic beauty this is a very likable camp site. It makes sense to combine Kumana safaris with excusions to Okanda Beach and Kudumbigala Rock, a heritage site that is a greaat vantage point, too.